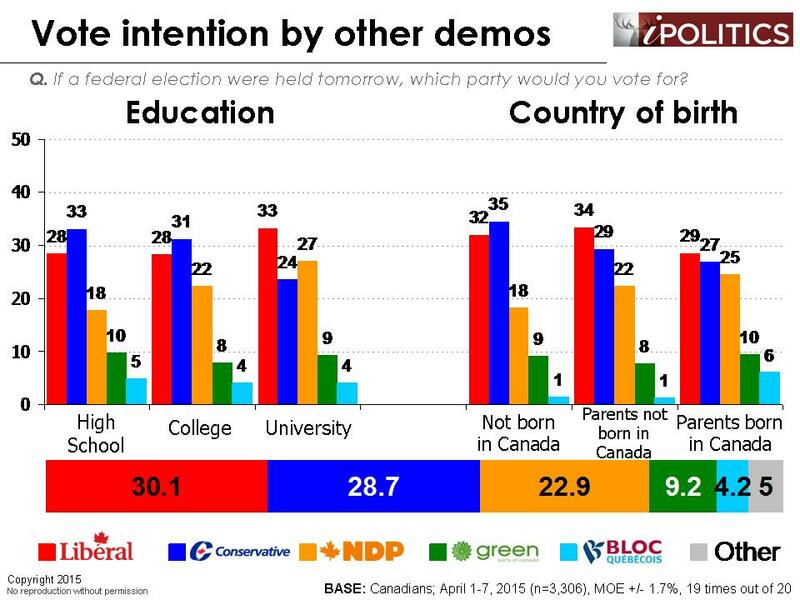 [Ottawa – April 10, 2015] If only eight percent of voters shifted their current vote intention, we would have a dead heat across the three lead parties. The voter landscape is shifting in ways that do not appear to favour Stephen Harper’s Conservatives who now find themselves under 29 points for the first time since the security bounce from last October propelled them into a small but significant lead (which now appears to have evaporated). 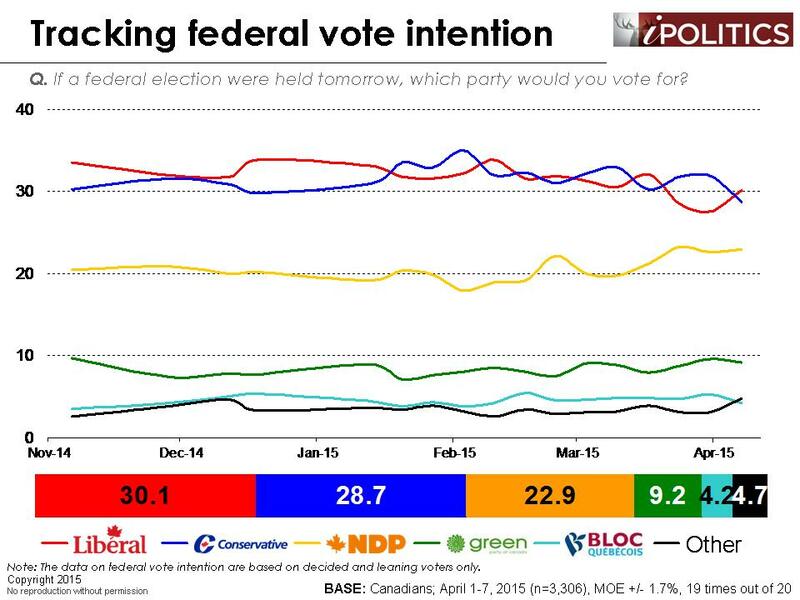 They now (insignificantly) trail Justin Trudeau’s Liberals and see less than a six-point margin over a clearly rejuvenated NDP. Despite the sliding fortunes for the Conservatives, they may well be encouraged to see that they are roughly in the same position with the Liberals as they were at a similar time before the last election which produced a majority. 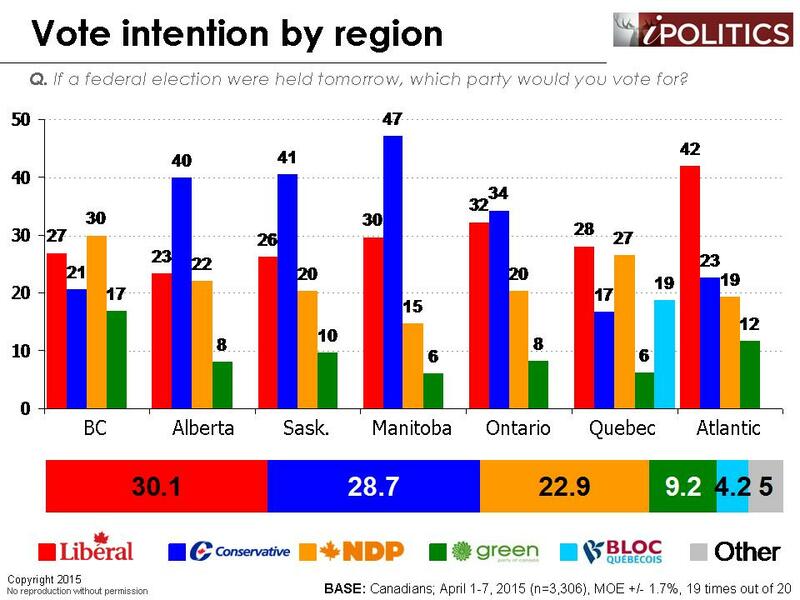 They do, however, face a number of sharper challenges, including a much stronger NDP than at a similar point in the lead up the 41st Election. Clearly, there are no certainties evident at this stage, but the latest movements see the Conservatives in a gentle slide which is connected to an eroding outlook on the economy, a worsening emotional connection between Stephen Harper and voters, and a drift downward in support for some of the key security issues which elevated their game in the fall of last year. The regional patterns look familiar with one important shift which bears monitoring. The Liberals have seen a sharp rise in support in Quebec. Ontario has also resumed the tie we have seen many times and the Conservatives have strong, albeit somewhat weakened hold on the Prairies. British Columbia is a competitive four-way race with the NDP showing newfound strength. The Green Party is holding steady nationally around nine points, but are a real force in British Columbia. 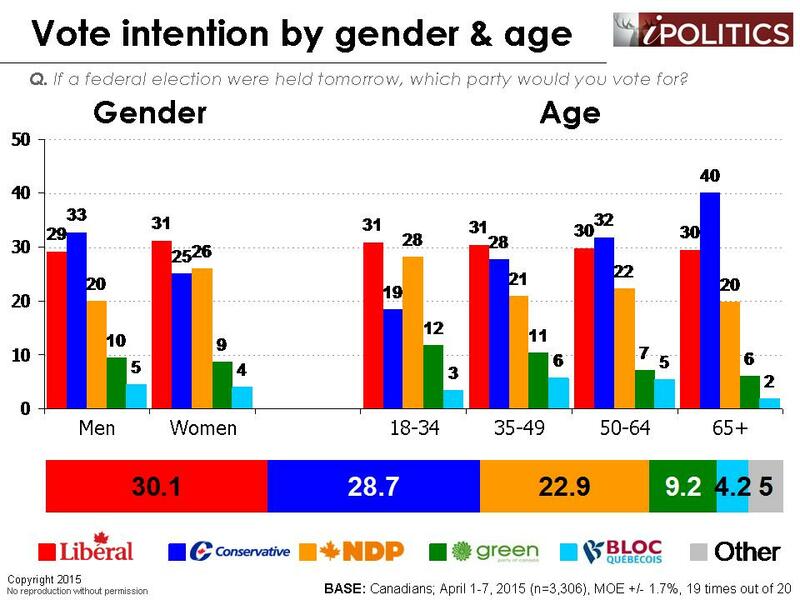 The Conservative continue to do much better with older voters and men (although this advantage has narrowed). Basically, the Conservatives do much worse with women, university educated, and residents of the non-Prairie provinces. Their slide in Quebec considerably dampens what appeared to be stronger than expected gains linked to Niqab position. One must wonder if this force is diminishing as did the secular charter force in the last election and the large disconnect with Quebeckers on social values and the extension of the mission in Iraq is now costing them. Given the critical role of emotions in winning elections, it is important to see how the various leaders are connecting and how that is changing. 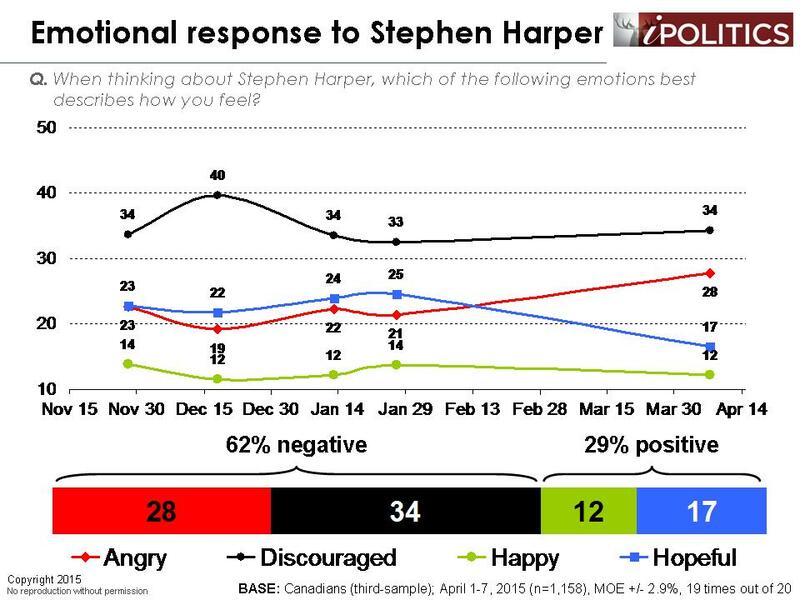 First of all, it is notable how weak the positive emotional connection of Stephen Harper is with all voters (outside of his base) and the trajectory is one of decline here. 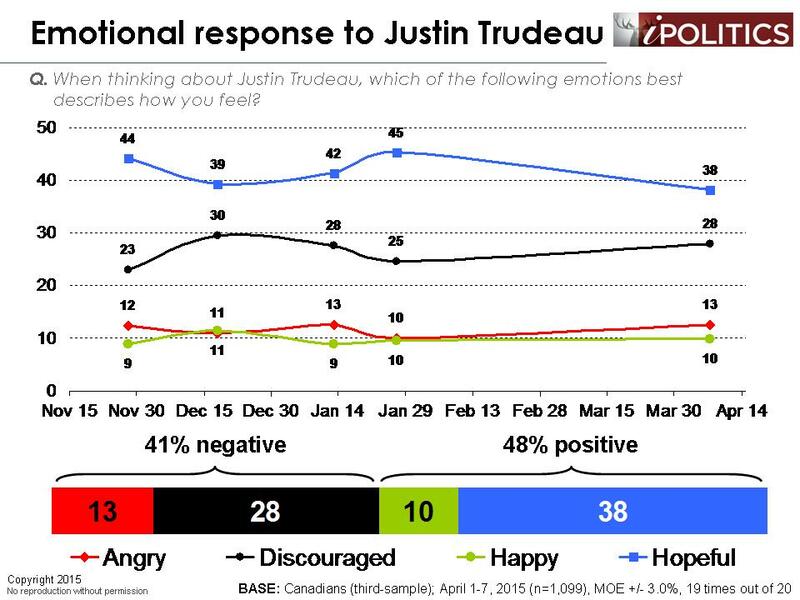 Only 29 per cent of respondents express positive emotions to Mr. Harper, and tracking reveals a steep drop-off in the percentage who say “hopeful”. This may be at the heart of his recent declining prospects and will be a critical challenge for him. 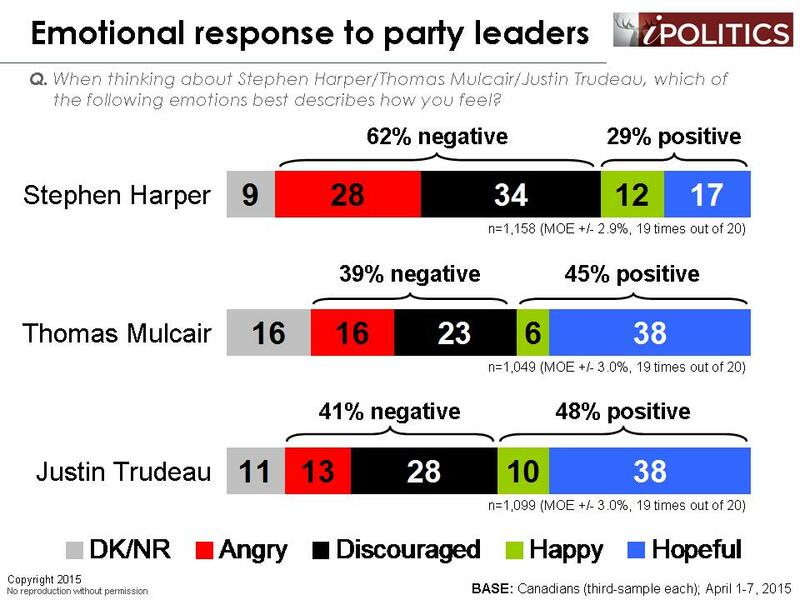 Both Mr. Mulcair and Mr. Trudeau generate equally high hopeful connections, but Mr. Trudeau has a slight advantage on overall positive position and he is seen as the least infuriating leader, a mantle clearly owned by Harper. We submit that the relative parity and substitutability of the two progressive leaders may render them ultimately bigger challenges to each other and their parties than Mr. Harper. The eroding positive emotional positioning of the Prime Minister is clearly evident in the charts below and, coupled with decline in support for core security issues and a very bleak outlook on the economy, suggests he will have a very difficult time reproducing his track to majority in 2011. 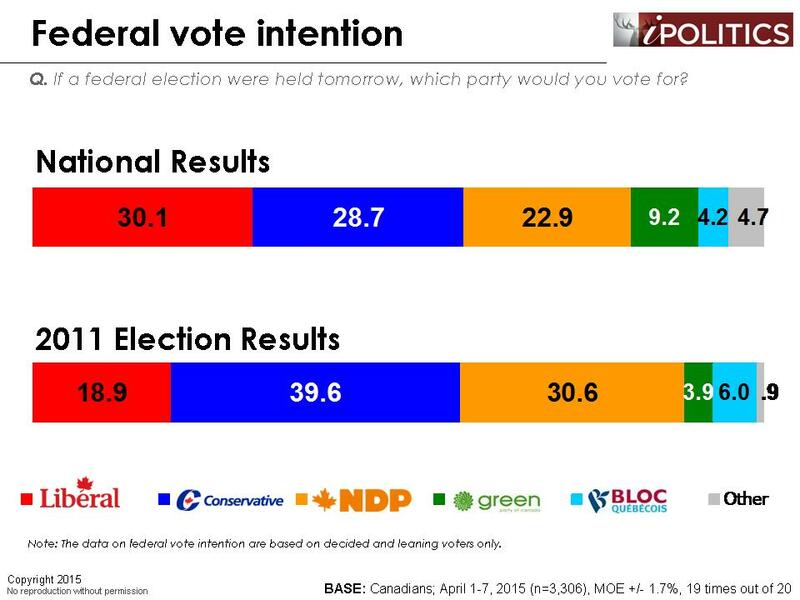 The fates of the Liberals and NDP are less clear, but it looks more likely now that the next government will not be a Conservative government, but obviously this is all subject to change. The field dates for this survey are April 1-7, 2015. 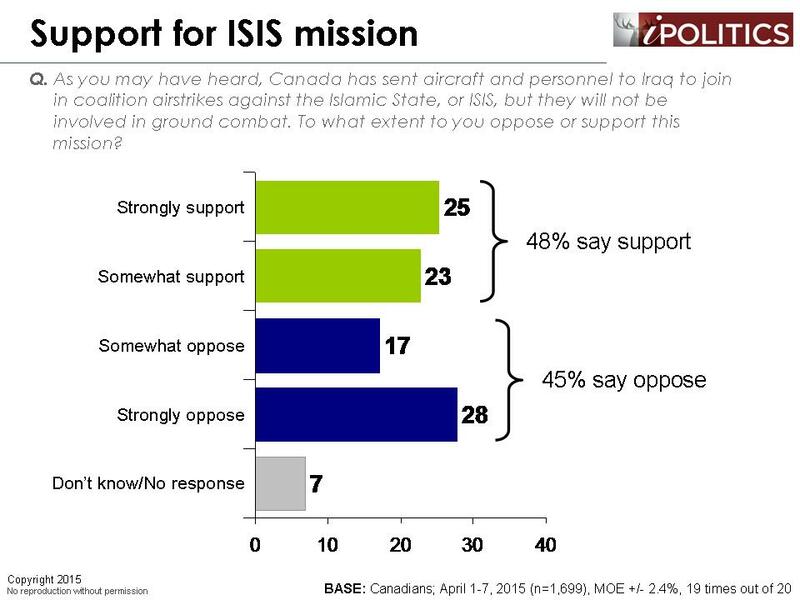 In total, a random sample of 3,306 Canadian adults aged 18 and over responded to the survey. The margin of error associated with the total sample is +/-1.7 percentage points, 19 times out of 20. Good report. Your process — contact methodology and questions seem to be more balanced than other pollsters. I follow you Frank … Keep up the good work. P.S. What are the chances of seeing you on CBC again ? Love to see Stephen Harper concede to a win by Justin Trudeau. 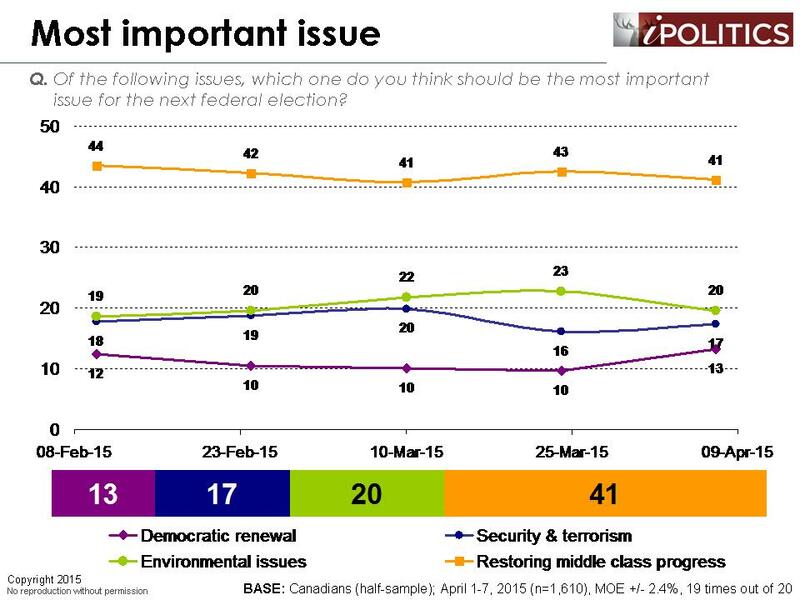 If Canadians are in their right mind they should get rid of Harper. Canada has already been shamed by other countries lets not throw our (once( great country in bigger shame. If Canadians are in their right mind they should not vote for the Conservatives. They already shamed Canada, why put further down. I for one like to see it at the top. Canada used to be a great country. Excellent graphics. In addition there is a lot more info and details than what I have seen on other surveys as we crawl towards the election. When are you doing the next poll?